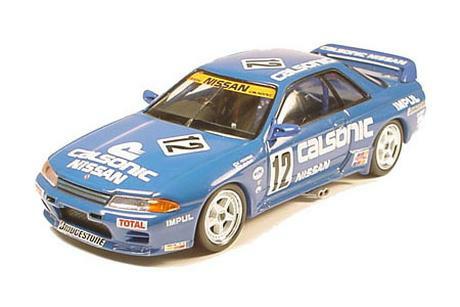 1/24 scale assembly kit of the Calsonic Skyline GT-R which achieved an impressive debut win at the 1990 All Japan Touring Car Championships. Special Feature 1 The famous form of the historic GT-R has been realistically reproduced as a plastic static model. Special Feature 2 Roll cage details included. Special Feature 3 Hood is detachable even after assembly to showcase details such as the 2,568cc 6-cylinder DOHC turbocharged engine, intercooler, and large radiator. Special Feature 4 Tires with realistic tread pattern and metal-plated wheels included.